Hey guys! Today I have a mani I wore several weeks ago! I was super sad to take it off :( I recently received my yearly (or twice yearly) order from Picture Polish. I mentioned before, I order several a time directly from them to get the best deal! I also have some newish Loaded Lacquers I'm dying to get into so I've been combining them a lot! 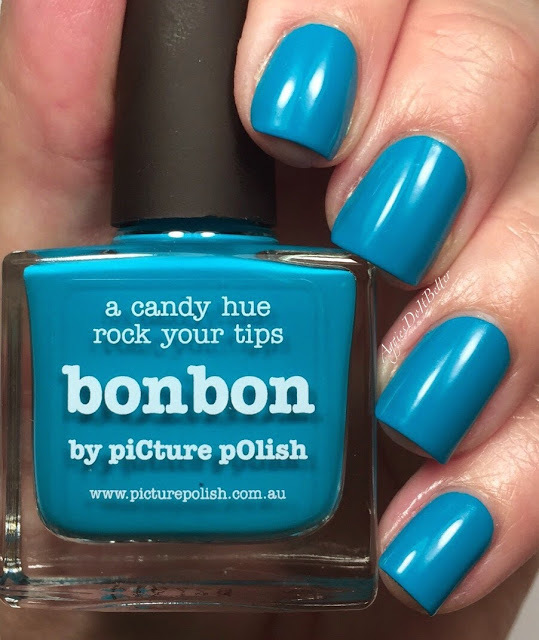 This is Picture Polish "BonBon", a gorgeous blue cream. So simple yet so beautiful! Previously my favorite blue cream was OPI Ogre the Top Blue, buutttttttt I think I have a new favorite now! The glitter is "Dashboard Dancing" from Loaded Lacquer. 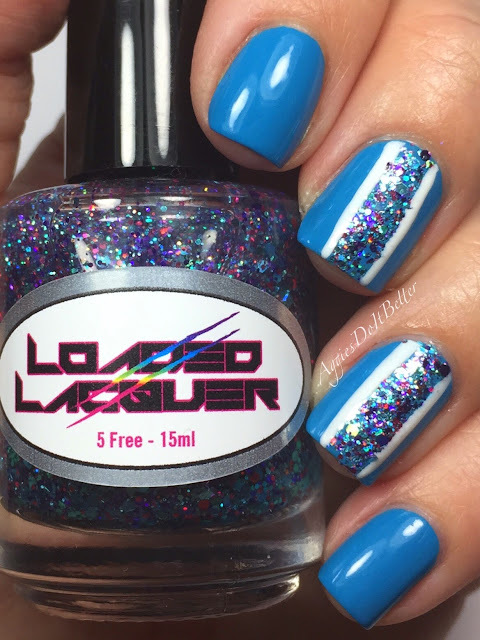 Its a fully loaded glitter bomb topper with turquoise, pink and purple hex glitters of all sizes in a clear base. I did have to color correct the blue a little so excuse the wonky skin tone! 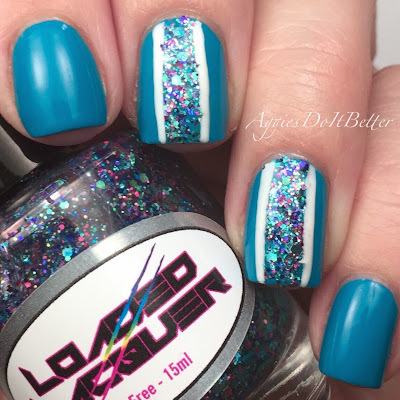 For this look, I just used some straight nail vinyls after the blue was dry and marked off an area for glitter. I applied the glitter to a sponge to sop up the base and then dabbed it on. I used Picture Polish Bright White and a striping brush to make the white lines after removing the vinyls, then a quick coat of top coat and done! Be sure to check out my Instagram page here for a quick little video tutorial! I just don't have time to make longer versions right now, but hopefully I will soon! Here is Bon Bon in all her glory. I will have a post coming up soon with swatches of the first half of the batch of my new PP's!